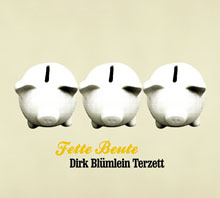 Bass player Dirk Blümlein, equally demanded in pop music as in jazz, has produced his second CD for Rodenstein Records. His trio (without harmony instrument) has developed a very special groovy yet very melodic sound. Electric bass, saxophone and drums are enough to create wonderful songs ranging from funky gems to intricate fusion songs and ballads. This record gives you a taste of Brazilian vitality and sun enjoy! The Lyrics by Fausto Israel are dealing with the poetic moments in life. Stories about music that leads you ibto the past, impressions of daces in Brazilian backyards and even an ironic love song for a dishwasher. Percussionist Chris Gavazzoni (another Brazilian) and Martin Simon (bass) lay the foundation for the wonderful songs and the melodic solos by saxophone player Olaf Schoenborn. Andreas Francke (Saxophon, clarinet). Studied Jazz at Stuttgart University. Playing in a lot of bands and CD recordings a.o. with Rainer Tempel Bigband und Mr. B´s Time Machine. With his amazing ability to play and fit in different styles of music he was asked to start teaching Jazz/Pop Drumming at the University of Music and Performing Arts Stuttgart in 2000. In recent years he has great demand, shaping all facets of music and working with artists such as Peter Herbolzheimer, Cornell Dupree, Martin Schrack, Randy Brecker, Ack van Rooyen, Jon Lord, Terell Stafford, PUR, Rainer Tempel, Scorpions, Heinz Rudolf Kunze, Bobby Shew, Nils Gessinger, Roger Chapman, Bobby Kimball, Geoff Whitehorn, Paul Heller, Cècile Verny, Ian Anderson, Claus Stötter, European Art Orchestra feat. Paquito d’Rivera, Paul Carrack, Jimi Jamison, Daniel Schnyder, German Pops Orchestra and many others. As well as being a driving force in Jazz, Pop and Rock he also works regularly with Symphony orchestras such as the Stuttgart Opera, Stuttgart Philharmonic Orchestra, SWR Radio Broadcast Orchestra Kaiserslautern, SWR Radio Brass, Wuertt. Philharmonic Orch. Reutlingen, Hofer Symphonic Orchestra, Staatskapelle Halle, Jena Philharmonic Orch. and the Stuttgart Chamber Orchestra. His work, including studio recordings and touring has taken him through the whole of Europe, USA, Mexico, Australia, New Zealand and most parts of South East Asia.